Every perfectionist should focus on these 7 things. I see so many of my clients get wrapped up with perfection. I have been guilty of constantly striving for perfection myself. I have measured my ability to be happy based on whether or not: I’m the perfect weight, I have the perfect job or I own the perfect house. I’ll warn you right now, you will never, ever, get to THERE. You never arrive at perfection so quit putting off your happiness until you get THERE. THERE is mythical. No one ever gets THERE. I won’t deny that there are peaks along the way; those moments we refer to as the milestones of life – falling in love, getting married, job promotions, graduations and births. But invariably we slide right back to our happiness set point within 6 months. Generally, hedonic adaptation involves a happiness “set point”, whereby humans generally maintain a constant level of happiness throughout their lives, despite events that occur in their environment. So whether it’s hitting the lottery or having a spinal cord injury, your level of happiness resets to the same pre-event level. The key is to change your set point, boost it; change the landscape. I’ve been working on this for the last year or so. It’s like setting your thermostat up one degree at a time. It’s a slow process but I think it is actually working. Seeing this photo of the Leaning Tower of Pisa prompted this post. It took over 344 years to build the tower and it was already leaning when they put on the second story. So, even though it was less than perfect, they kept at it. It is a nice metaphor. Embrace the lean and keep going. Keep building; one stone at a time. 1. Accept. 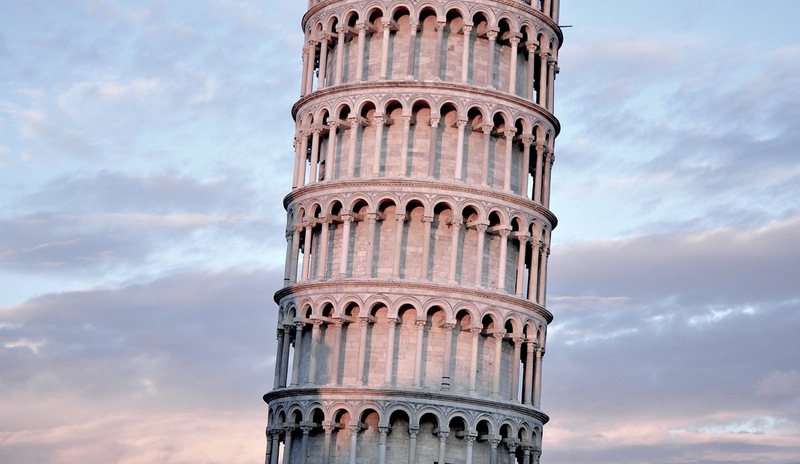 Obviously, the town and builders of Pisa accepted the lean. In fact, they have said they would rather see the tower topple than fix the lean. There is peace in acceptance. Where are you leaning right now? I’m not at my ideal weight. I’m still paying for student loans from my Master’s degree and, apparently, I’m not getting any younger. This is all true but getting on the scale in the morning cannot be the barometer of how I will feel all day. A pound up or a pound down. Hmmm. Interesting. One more data point. It’s still going to be a great day. Accept what is. 2. Gratitude. I’ve been writing a gratitude journal for over three years. Every evening I write in it before I go to sleep. Usually it’s anywhere from four to ten names of people (or my dog) that I am grateful for. I’m not sure why I focus on people who had an impact on me during the day, it may have to do with how involved I have been with people in my career. You can write anything you want whether it’s the blue sky, the much needed rain or the roof over your head. Counting your blessings helps you focus on what is right with your world. This has had a huge impact on me. It keeps my glass half full. Focus on what you are grateful for. 3. Beauty. Beauty is everywhere. In the middle of winter it’s easy to see the outside world as cold and barren; leafless trees and arctic winds can seem ugly. But it’s all in how you look at it. A bracing wind makes me feel every part of my body. Barren trees make the squirrels, deer and birds much more apparent and reliant on us. There is the beauty of being snuggled up in bed when the wind is howling outside whether it’s with a good book, on the phone with a good friend or sleep. There is a beauty of slowing down to some degree with the seasons. And there is the truth that the beauty of the tower is the lean. Seek out the lean and the hidden beauty. 4. Reflection. Reflect on what you have accomplished. Most of the reason that coaching is so effective is that you have an outside person ask you to take stock in what you have done. We spend so much of our time thinking about what we haven’t done. Instead we need to think about all that we have done. I walked today, I made dinner, I worked, I wrote, I spent time with my dog, I finally sent that overdue email, I did laundry and so on. I have clients who put off our appointment because they feel like they didn’t get any action items done. When we end up meeting, even if they are resistant, they find out that they’ve done more than half their action items. They were just focusing on what they hadn’t done. Take time to reflect on what you have done and give yourself credit. 5. Reframe. Context is everything. Our perception of what we are achieving is completely in our own heads. We are the bellwether, not anyone else. Or we can be at the hands of “What will the public think or judge?” So, if you live in an expensive neighborhood, your Hyundai will never be good enough yet if you drive through a less expensive neighborhood, it might be the most coveted car on the block. I love a cartoon that was going around on Facebook that said “I wish I was as fat as when I thought I was fat”. Reframe and be OK with right now. 6. Optimalist. As written in an article by James Woodworth, ” Optimalists accept that life can be tough and painful at times. Their realism enables them to build resilience and the ability to cope with the difficulties life presents them.” This is the opposite of a perfectionist. Perfectionists are constantly disappointed by falling short as well as by every failure. They dwell on every shortcoming and they never push the envelope. Optimalists don’t fear what they might lose. They believe in the gain. The folks in Pisa didn’t worry about the tower tumbling down. Push the envelope and be an Optimalist. 7. Moment. Be in the moment. Be present. Perfectionists are constantly thinking about “what if” and are overly busy protecting their image and the “what ifs”. When you are doing this, you are missing what is in front of you. Enjoy what you’re looking at – how the sun hit that tree at just the right angle, or the taste of the coffee or the feel of the sheets. It’s your life; be there for it. Be here. Right now. Feel the chair. Feel your breath. Listen to the buzz of the room. This moment; right now. Much like the folks of Pisa, this all takes patience. Nothing is accomplished overnight. Congratulate yourself with each small step. If you take a step back, so what, brush it off and know that you are on the right path. An imperfect path. Gender bias at work. Who is making the coffee in your office? 7 Apps No Traveler Should be Without. I loved this post! I’m the type of perfectionist that has a difficult time even looking at the Leaning Tower. My (self diagnosed 😉 OCD goes all crazy! I look forward to incorporating some of your tips. I am curious about what you said near the 3rd paragraph about “change your set point”. Do you think you could expand more on what your personal journey has been or maybe even a “how to” post? I’m concerned that myset point is lower than I’d like it to be and don’t know where to start to do something about it. I’m so glad you enjoyed the post! I first became aware of the happiness set point by reading The Happiness Project by Gretchen Rubin. The book follows her as she spends an entire year adding routines and mindsets to adjust her happiness set point. I would recommend reading that book. Another great book is The Pursuit of Perfect by Tal Ben-Shahar. I also have a few more posts if you search “Good Enough is Perfect” and “Untether the Balloon”. But the actual “how to” is a great topic for a post. I’ll try and write something in the next few weeks. Thanks so much for the feedback! Thanks for the tips! I’ll be sure to check them out and look forward to the new post!